I don't really know where I'm at right now, but I'm guessing it's between advanced beginner or beginner intermediate. But I would like to know for sure. Is there any way I can test my skills and find out where I am? Currently there is only one test - Japanese Language Proficiency Test (JLPT) - that you can take to evaluate the competency of your Japanese language (for non-native speakers). Find out more details about JLPT on the link. Alternatively, it's faster and easier that you can find a native Japanese teacher to test and check your Japanese level. However, I would like to stress that it's not so important about what's your Japanese level now. It's what motivates you to learn Japanese that counts. Even if you can achieve JLPT N1 level, it doesn't mean that you are at the top and there is nothing more to learn. In fact you will realize that there is even more things that you don't know about Japanese and want to learn further. You will aware that what you have learned so far is only a fraction of the language itself. My opinion is that learning a language is a life-long event. You have to be passionate about the language in order to continue learning it, even after you achieved the advance level. JLPT is just a rough guide of your Japanese level. Try not to limit yourself on thinking what's your current level. I hope I am not discouraging you on learning Japanese further. I just hope you don't limit yourself on "What level I'm at?" kind of thinking. Think beyond and think further. By the way, you can continue to take Business Japanese Proficiency Test (BJT) after JLPT N1 if you want to pursue further. 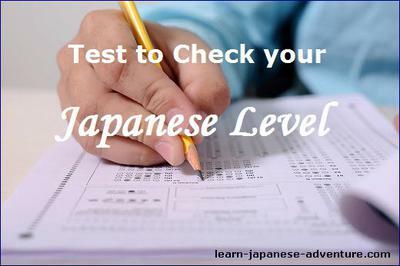 It's test administered by the Japan Kanji Aptitude Testing Foundation used to measure a person's proficiency at communication using Japanese in a business environment. Comments for Is there a test i can take just to see what level i am at? Japanese learning podcasts are a good way to check your level. Find a website with free podcasts or a free trial. Listen to or download some upper beginner or early lower intermediate lessons. Some of the bigger names even have mock JLPT quizzes to help users find their level.